One of the competing Lunar XPrize teams was SpaceIL from Israel, which was developing a small lunar spacecraft named Beresheet (originally named Sparrow), that was designed to hitch a ride into an elliptical Earth orbit as a secondary payload on a SpaceX Falcon 9 commercial launch vehicle and then transfer itself to a lunar orbit and finally land on the Moon. As completed by SpaceIL and Israel Aerospace Industries (IAI), the Beresheet spacecraft has a launch mass of 600 kg (1,323 pounds) and a landing mass of about 180 kg (397 pounds). 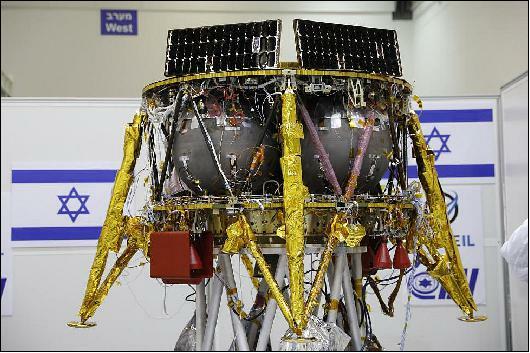 The lander carries imagers, a magnetometer, a laser retro-reflector array (LRA) provided by the U.S. National Aeronautics and Space Administration (NASA), and a time capsule of cultural and historical Israeli artifacts. Beresheet was launched from Cape Canaveral, FL on 21 Feb 2019 into an initial elliptical Geosynchronous Transfer Orbit (GTO) that was dictated by the requirements for the Falcon 9 booster’s primary payload. Once in GTO, Beresheet used its small rocket engine to gradually raise its orbit to a 400,000 km (248,548 mile) apogee to intersect the Moon’s circular orbit, and phase its orbit so the spacecraft passed close to the Moon and could maneuver into a transfer orbit and be captured by the Moon’s gravity. This mission profile is illustrated below. 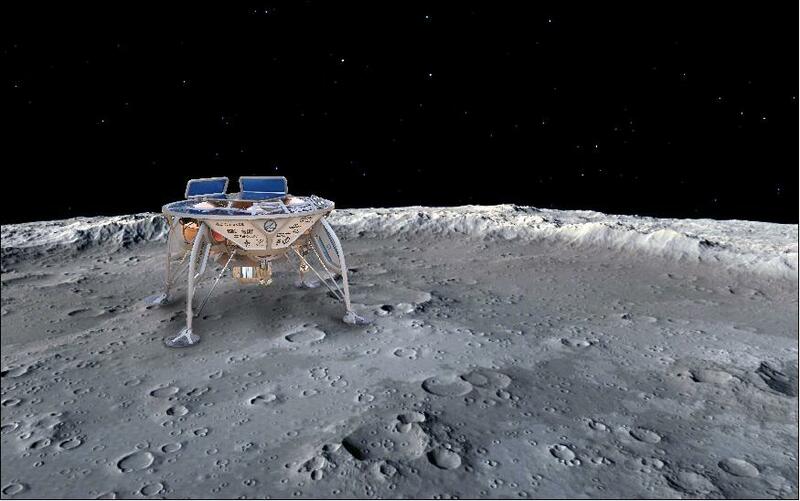 After circularizing its lunar orbit, Beresheet is scheduled to land on the Moon on 11 April 2019. NASA is providing communications support during the mission. Artist’s concept of the Beresheet lander on the lunar surface. 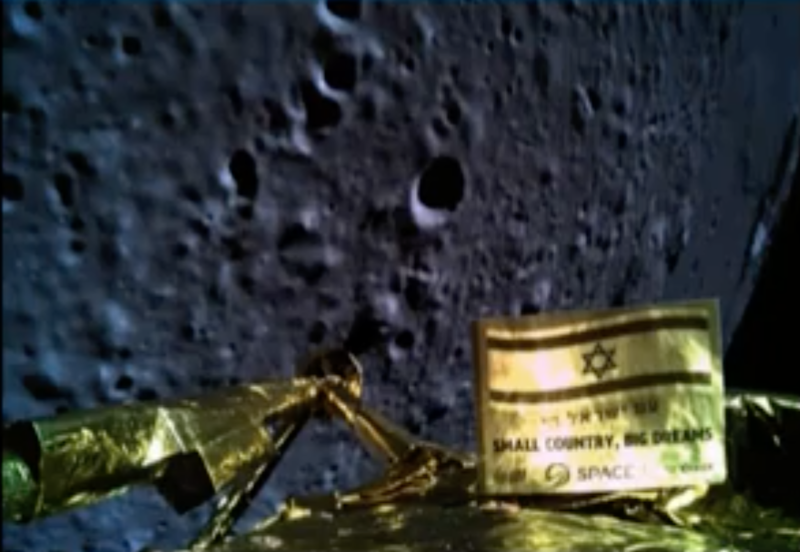 Best wishes to the SpaceIL team for a successful lunar landing. If successful, Israel will become the 4thnation, after Russia (Soviet Union), USA and China to land spacecraft on the Moon. 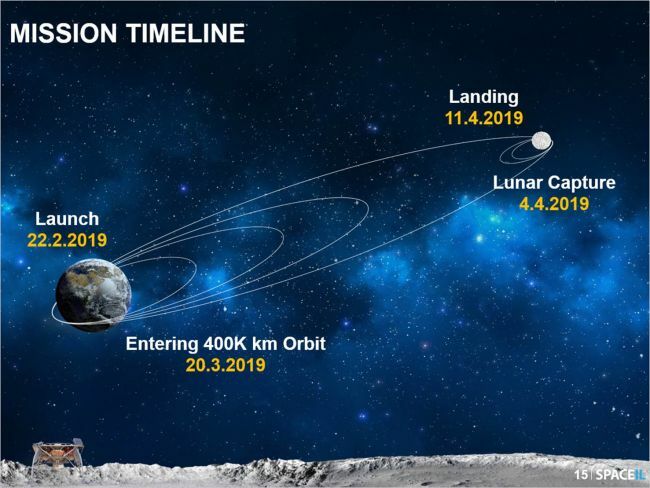 The Beresheet spacecraft successfully initiating its descent from lunar orbit on 11 April 2019. Initial telemetry indicated that the landing profile was proceeding as planned. 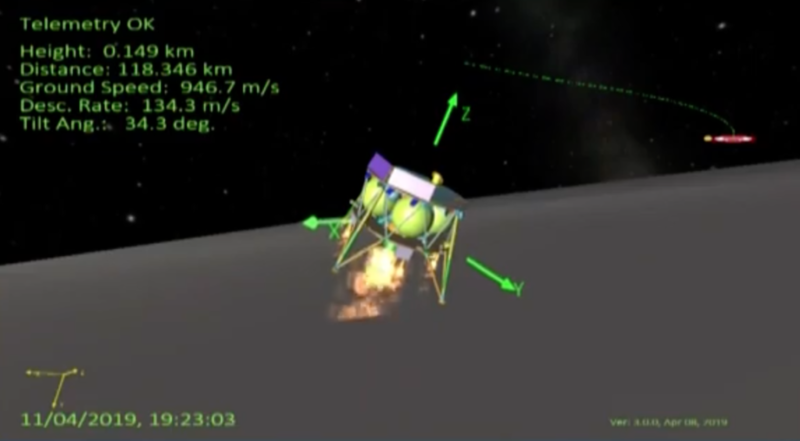 Beresheet status graphic during landing sequence. X Prize founder and Executive Chairman Peter Diamandis announced that SpaceIL and IAI will receive the $1 million Moonshot Award despite failing to make the planned soft landing on the Moon. 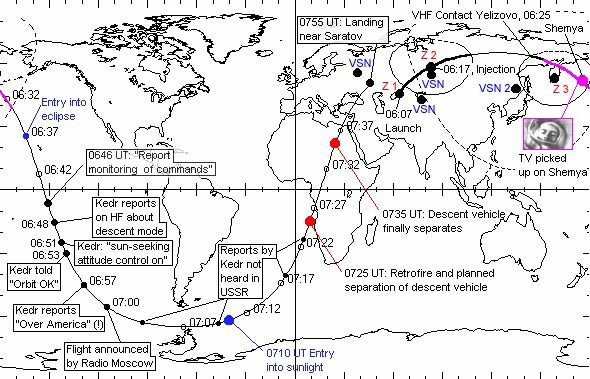 On 12 April 1961, the Soviet Union launched the Vostok 1 (“East” 1) spacecraft and astronaut Major Yuri Gagarin from a launch site in Kazakhstan on the first ever manned space mission. 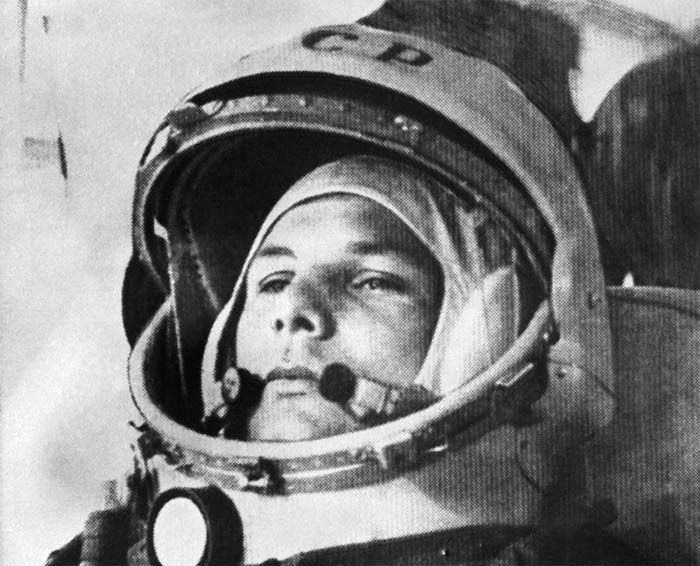 Gagarin became the first person to fly above the Karman line that marks the beginning of space, at 62 miles (330,000 feet, 100 km) above the Earth. He also became the first person to achieve Earth orbit. 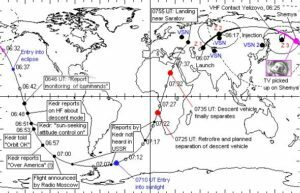 Basic orbital parameters for Vostok 1 were: apogee: 203 miles (327 km), perigee: 117 miles (189 km), and orbital period: 89.1 minutes. Gagarin completed one orbit. After re-entry, Gagarin ejected from the Vostok capsule at an altitude of about 4.3 miles (7 km) and parachuted to the ground. 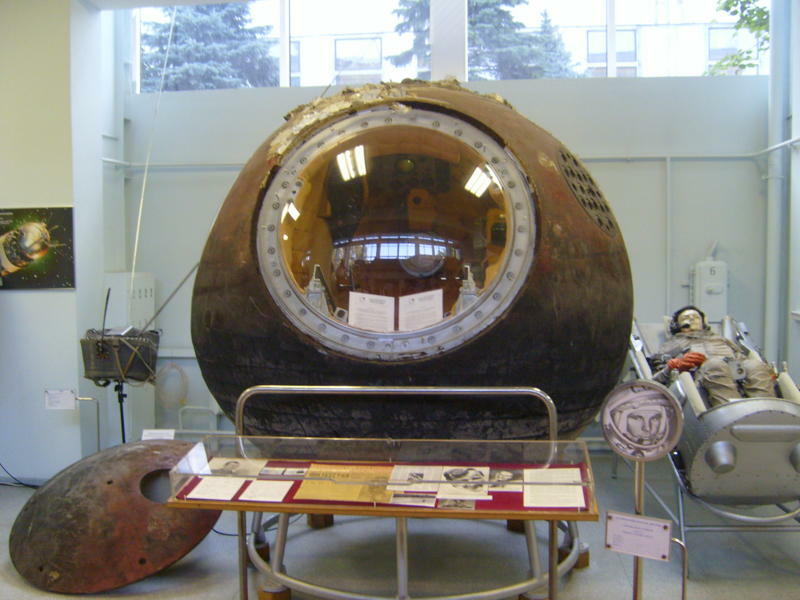 The capsule descended under its own parachute and was recovered near Engels, Russia. Gagarin’s total flight time was 1 hour, 48 minutes. 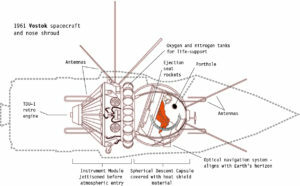 The configuration of the Vostok spacecraft is shown in the following diagram. 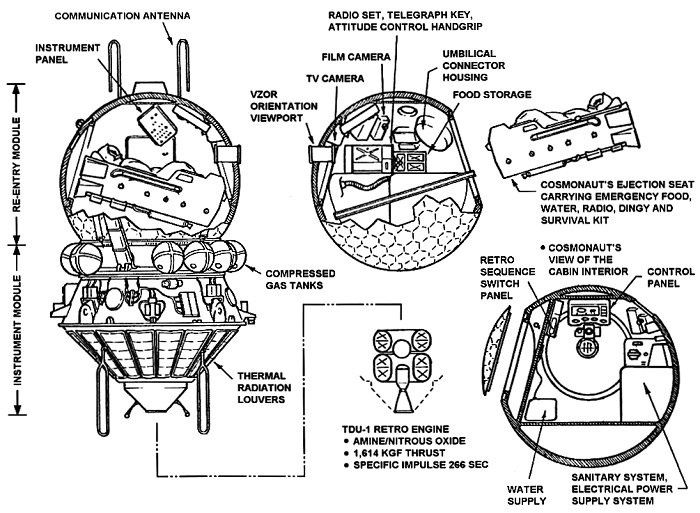 The reentry vehicle is the spherical capsule, which on the left is shown attached to the instrument module. The complete spacecraft had a mass of 4.73 tons (4,300 kg) and measured 14.4 feet (4.4 meters) in length and 8 feet (2.43 meters) in diameter. 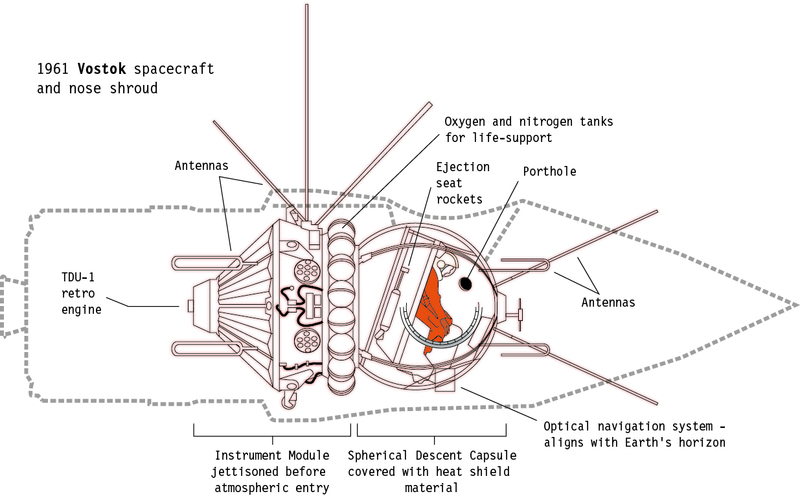 The placement of the spacecraft inside the nose shroud of the launch vehicle is shown in the following diagram. Yuri Gagarin’s Vostok I capsule is on display at the RKK Energiya museum, which is on the grounds of the RKK Energiya factory in Korolyov, near Moscow. Gagarin died in a jet training flight on 27 March 1968. The Soviet’s Vostok launch vehicle was unveiled to the public at the June 1967 Paris Air Show. This was a big launch vehicle for the time, with a length of 126 feet (38.4 m) and a diameter of about 35 feet (10.7 m). The Vostok launcher, designed by Sergei Korolov, was based on the Soviet R-7 (Semyorka) intercontinental ballistic missile (ICBM). Earlier versions of the R-7 were used to put the first man-made satellite, Sputnik 1, in Earth orbit on 4 October 1957 and to launch the early Luna spacecraft that, in 1959, achieved the milestones of first spacecraft to escape Earth’s gravity and enter a solar orbit (Luna 1) and first spacecraft to impact the Moon (Luna 2). 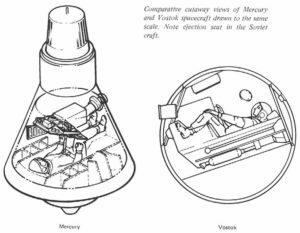 About one month after Gagarin’s milestone orbital flight, U.S. Project Mercury astronaut Alan Shepard was launched on 5 May 1961 by a Mercury-Redstone booster on a 15-minute suborbital flight. In the Freedom 7 capsule, Shepard reached a maximum altitude of 116.5 miles (187.5 km) and was recovered about 302 miles (487 km) downrange from Cape Canaveral after landing in the Atlantic Ocean. The Freedom 7 capsule is on display in the museum at the John F. Kennedy Presidential Library on Columbia Point in Boston, on loan from the Smithsonian National Air and Space Museum. Alan Shepard died on 21 July 1998. On 20 February 1962, astronaut John Glenn became the first American to reach Earth orbit. 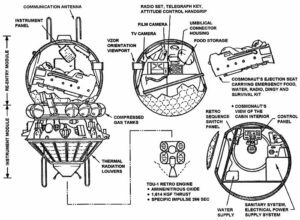 The Mercury-Atlas booster placed the Friendship 7 capsule and Glenn into a low Earth orbit with the following basic parameters: apogee: 154 miles (248 km), perigee: 87 miles (140 km), and orbital period: 88.5 minutes. 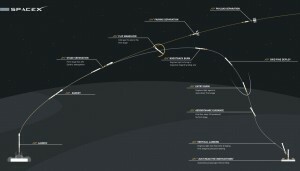 Glenn completed three orbits in a flight lasting 4 hours and 55 minutes, with recovery in the Atlantic Ocean. The Friendship 7 capsule is on display at the Smithsonian National Air and Space Museum, Washington D.C. John Glenn died on 8 December 2016. 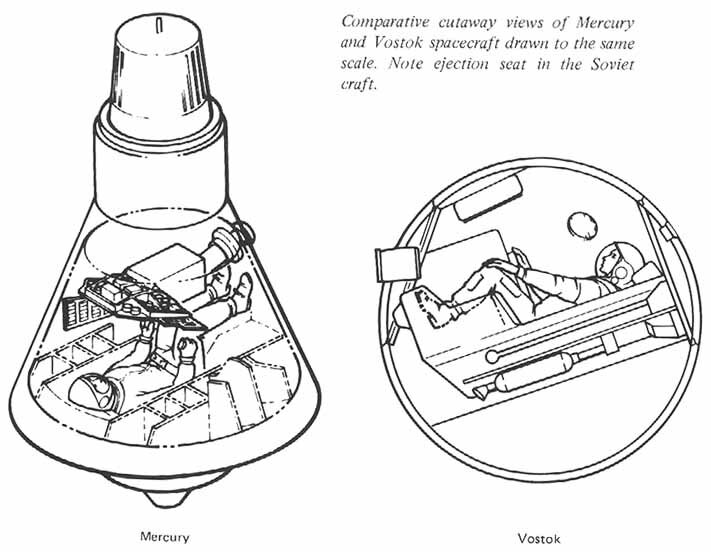 A comparison of the Mercury and Vostok reentry capsules is shown in the following scale diagram. NASA’s manned space program will take even longer to resume manned spaceflight missions. 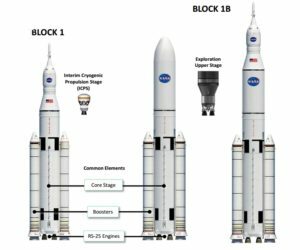 The first launch of NASA’s Space Launch System (SLS) with the new Orion multi-purpose crew vehicle currently is expected to occur in 2018. As currently planned, the Exploration Mission 1 (EM-1) will be an unmanned mission. NASA is considering making EM-1 a manned mission and launching in 2019. In my 12 April 2016 post, “Landing a Reusable Booster Rocket on a Dime,” I discussed the first successful flights and recoveries of the SpaceX Falcon 9 orbital booster rocket and Blue Origin’s New Shepard suborbital booster rocket. In the past year, both SpaceX and Blue Origin have successfully launched and recovered several rockets. In addition, SpaceX and Blue Origin both have reused one or more booster rockets that were flown on previous missions. Here’s a quick look at the SpaceX and Blue Origin track records and their future plans for even more ambitious recoverable launch vehicles. We’ll also take a brief look at what competitors are doing with their existing and planned launch vehicles. 8,862 pounds (4.02 metric tons, 4,020 kg) to escape velocity. 29,983 pounds (13.6 metric tons, 13,600) kg to escape velocity. The first Falcon Heavy is expected to be launched in late 2017. 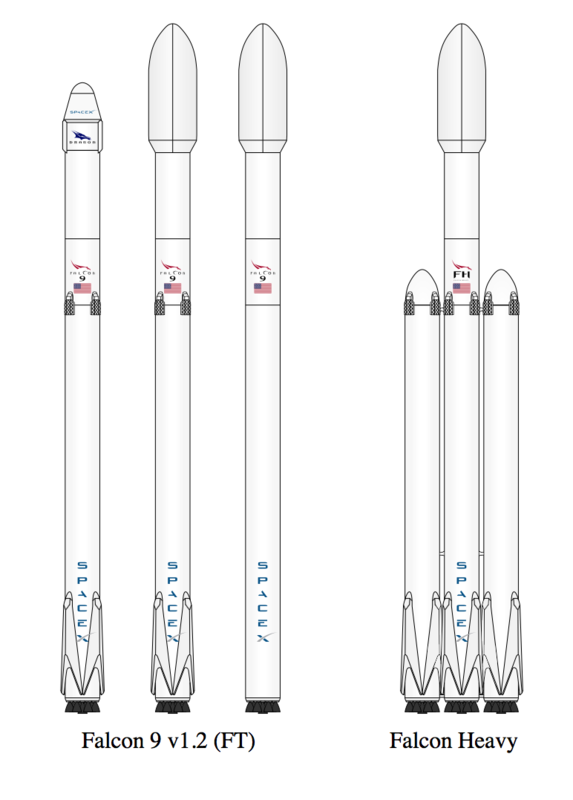 The Falcon 9 v1.2 family and the Falcon Heavy launch vehicles are shown in the following diagram. The scale-up from Falcon 9 V1.2 to Falcon Heavy is relatively straightforward. 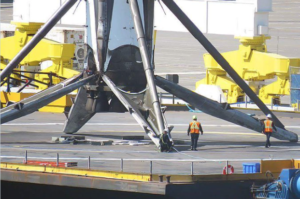 Versions designed for recovering the first stage include four extendable landing legs near the base of the rocket. 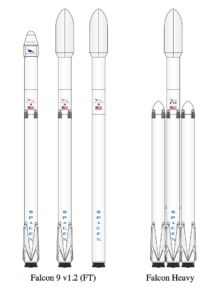 In the diagram below, you can see that one version of the Falcon 9 does not include the landing legs, sacrificing booster recovery for greater booster performance. estimated total mass is 94,578 pounds (42,900 kg) with 5% residual fuel after landing. The large scale of the Falcon 9 booster is apparent in the following photo taken after a landing on the stationary drone ship. 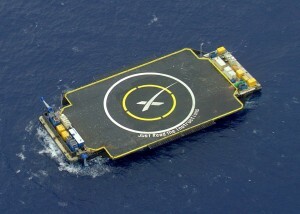 The first reuse of a Falcon 9 booster stage, which was recovered on the drone barge and will be available again for reuse. The first recovery of the costly (about $6 million) payload fairing, which was jettisoned during ascent and returned under parachute for an ocean splashdown. The payload fairing will be reused. The number of times a Falcon 9 first stage can be re-flown is not clearly specified. However, Elon Musk placed that number at 10 – 20 additional missions, and, with minor refurbishment, up to 100 missions. Falcon Heavy missions will involve considerably more complex, simultaneous, autonomous booster recovery operations. The port and starboard Falcon 9 boosters will separate first and fly to designated recovery points, likely on land. The core booster will burn longer before separating from the second stage, which will take the payload into orbit. After separation, the core Falcon 9 booster also will fly to a designated recovery point, likely on a downrange drone ship. After a Falcon Heavy launch, it literally will be raining Falcon 9 boosters. This will be a spectacular demonstration of autonomous flight control and range safety. SpaceX has been developing the recoverable Dragon space capsule as a family of spacecraft to be launched by the Falcon booster to conduct a variety of orbital and interplanetary missions. Like the recoverable Falcon booster, the Dragon capsule uses aerodynamic forces to slow its descent into the atmosphere and rocket propulsion for the final landing phase. Dragon CRS: Since October 2012, this unmanned cargo version of the Dragon space capsule has been conducting Commercial Resupply Service (CRS) missions to the International Space Station (ISS) and returning cargo to Earth. Dragon CRS “free-flyer”: The Dragon capsule also can operate independently in Earth orbit carrying a variety of payloads and returning them to Earth. Dragon 2: This is a human-rated version of the Dragon space capsule. The first manned orbital flight in expected 2018. Red Dragon: This is an unmanned version of Dragon 2 adapted for a mission to Mars and launched by a Falcon Heavy. Red Dragon is designed to make a propulsive landing on Mars’ surface with a 2,200 pound (1,000 kg) payload. The first launch of a Red Dragon mission could occur as early as 2018. Thereafter, SpaceX plans to conduct “regular “ (as suitable launch windows occur) Red Dragon missions to Mars. 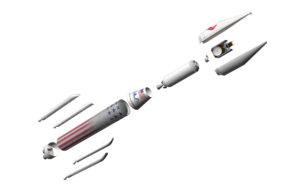 As shown in the following diagram, the ITS booster rocket carrying the interplanetary spacecraft is much larger than the National Aeronautics and Space Administration’s (NASA) Saturn V used in the 1960s and 1970s on the Apollo lunar missions. At launch, the ITS will be 400 ft (122 m) tall and 39.4 ft (12 m) in diameter. With 42 Raptor sub-cooled liquid methane / liquid oxygen engines, the first stage will have a liftoff thrust of about 26 million pounds, which is more than three times the thrust of Saturn V. This engine configuration is reminiscent of the Soviet N-1 moon rocket, (circa late 1960s), which clustered 30 engines in a similar configuration. ITS can lift ten times the payload of the Falcon Heavy booster. The first stage of the ITS launch vehicle will be designed to fly back to the launch site for rapid servicing and reuse (i.e., to launch the refueling tanker spacecraft). 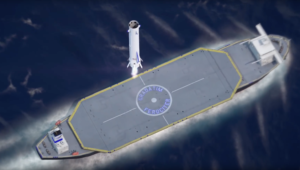 In landing configuration, the ITS booster stage will be about 254 ft (77.5 m) long with a dry mass of about 275 tons (25 metric tons, 250,000 kg). You can watch Elon Musk’s briefing on the ITS concept, including a short video of the ITS launch and interplanetary mission profile, at the following link. Can you spell A M B I T I O U S? The SpaceX ITS concept certainly is ambitious, but it offers a much more compelling vision of future manned spaceflight than anything NASA has offered over the past decade. New Shepard is a small, single stage, suborbital rocket intended for research and commercial passenger service to the fringe of space, above the Karman line at 62 miles (330,000 ft, 100 km) above the Earth. New Shepard is named for Project Mercury astronaut Alan Shepard, who, on 5 May 1961, made the first U.S. suborbital flight in the Freedom 7 capsule launched from Cape Canaveral by a Redstone rocket. The New Shepard, in launch and recovery configurations, is shown in the following figure. In all of these New Shepard unmanned test flights, the passenger capsule was recovered. 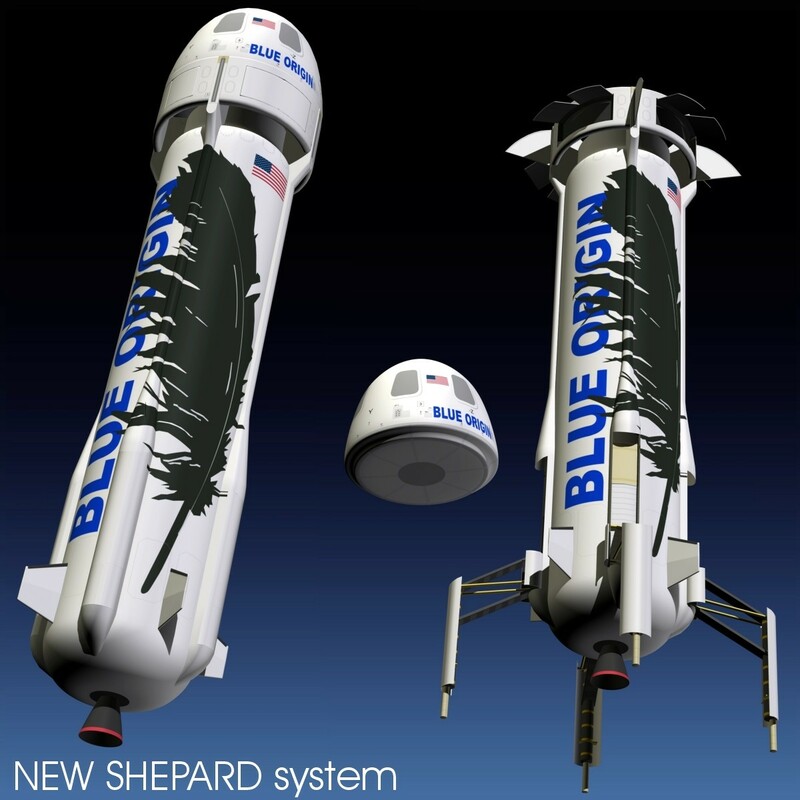 Blue Origin expects to conduct the first manned tests of New Shepard in late 2017. Commercial passenger flights, with up to six people in the space capsule, could begin in 2018. 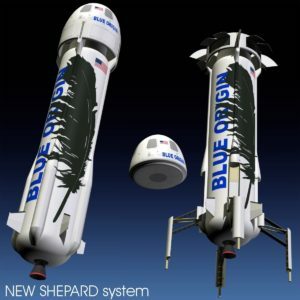 Blue Origin has stated that they may be able to conduct as many as 50 New Shepard flights per year. On 12 September 2016, Jeff Bezos announced Blue Origin’s plans to develop New Glenn, which is a very large, heavy-lift, 2- or 3-stage reusable launch vehicle. New Glenn is named for Project Mercury astronaut John Glenn, who, on 20 February 1962, became the first U.S. astronaut to reach orbit. John Glenn flew in the Friendship 7 capsule launched from Cape Canaveral by an Atlas rocket. The size of New Glenn is apparent n the following diagram. 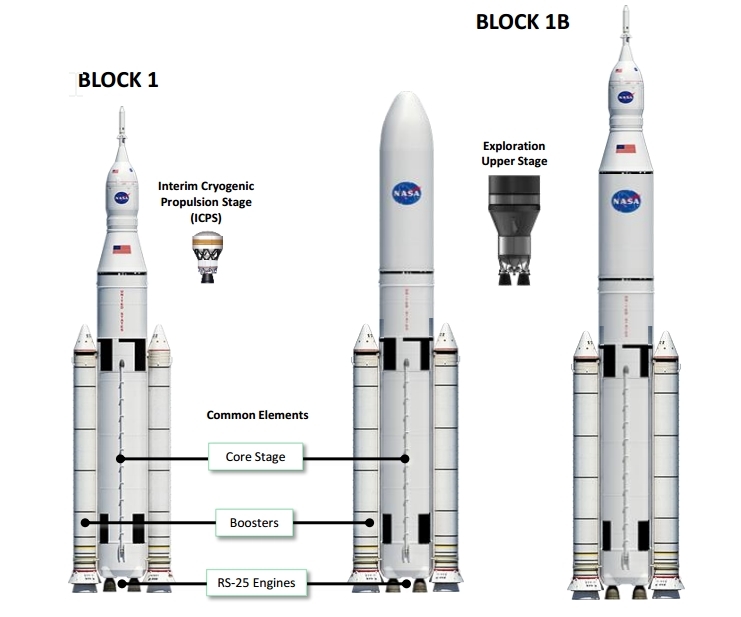 The two-stage version will be 270 ft (82 m) tall, and the three-stage version will be 313 ft (95 m) tall, approaching the size of NASA’s Saturn V.
The New Glenn first stage is powered by seven BE-4 methane / LOX engines rated at a combined 3.85 million pounds of thrust (about ½ of the Saturn V), the second stage is powered by a single BE-4 engine optimized for vacuum conditions and rated at 550,000 pounds of thrust, and the third stage is powered by one BE-3 liquid hydrogen / LOX engine rated at 110,000 pounds thrust. The BE-4 engines in the reusable first stage are designed with a 100-flight lifetime. 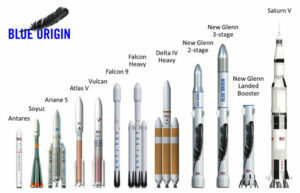 A more detailed size comparison between New Shepard, Falcon 9 and New Glenn is shown in the following diagram. The three-stage New Glenn will carry heavier payloads. The first stage of the New Glenn booster is being designed to fly to a designated landing site to be recovered. Aerodynamic surfaces on the first stage will give New Glenn more aerodynamic maneuvering capability than the SpaceX Falcon during the descent to landing. On 7 March 2017, Jeff Bezos gave the following details on the recovery of the first stage. Of course, rocket propulsion is needed for the final phase of landing on a large, moving platform at sea. The first stage has six extendable landing legs, and can land safely if only five deploy. New Glenn flights are expected to start in 2020, about three years after the first SpaceX Falcon Heavy flight. What are other launch vehicle competitors doing? 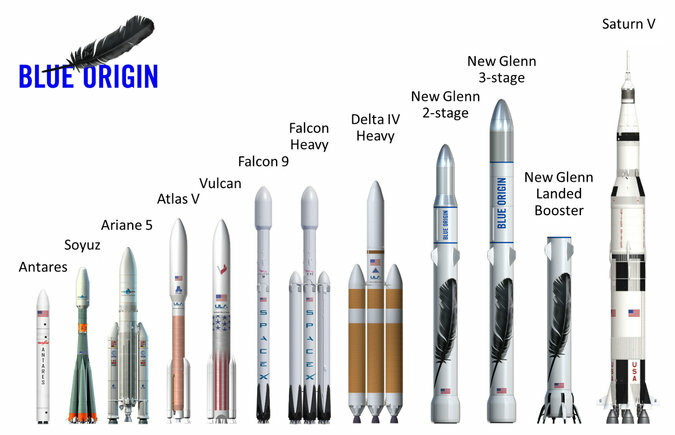 No other operational or planned launch vehicles offer the extent of reusability found in the SpaceX Falcon and ITS and the Blue Origin New Shepard and New Glenn. The following launch vehicles will offer only partial reusability. NASA is developing the SLS to launch heavy payloads into Earth orbit and to launch the Orion manned spacecraft on a variety of near-Earth and deep space missions. 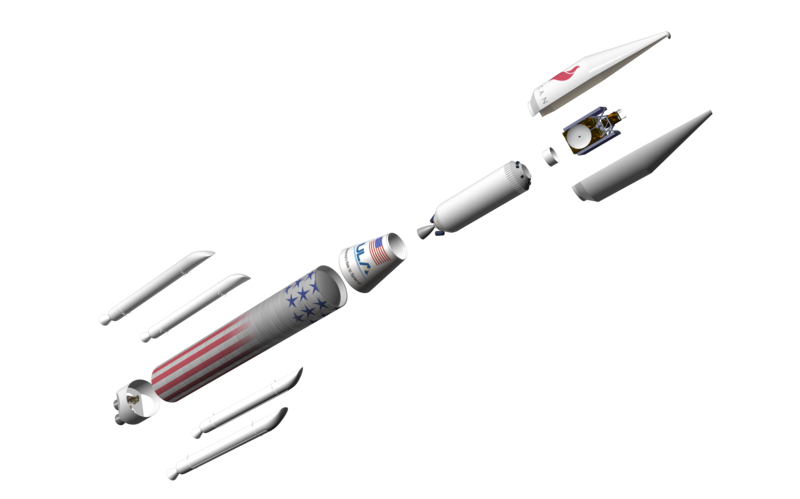 As shown in the following diagram, the SLS booster rocket has a large, liquid-fueled, two-stage core flanked by two large solid rocket boosters manufactured by Orbital ATK. SLS is designed to put 150,000 to 290,000 pounds (70,000 to 130,000 kg) into LEO. As with the NASA Space Shuttle, the solid rocket boosters are designed to be recovered and reused. However, the liquid-fueled first stage booster is expendable; not designed for reuse. ULA currently provides medium- and heavy-lift launch with the expendable Atlas V, Delta III and Delta IV boosters. In April 2015, ULA announced that they were developing Vulcan as their Next-Generation Launch System (NGLS) to support a wide variety of Earth-orbital and interplanetary missions. In August 2016, ULA announced plans to qualify Vulcan for manned space missions. 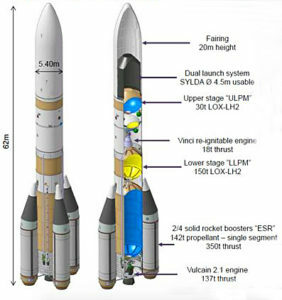 As shown in the following diagram, Vulcan is comprised of a liquid-fueled, two-stage core rocket that can be augmented with up to six solid rocket boosters as needed for the specific mission. This basic architecture is quite similar to ULA’s current Delta III booster, but on a larger scale. Vulcan’s maximum payload capacity is expected to fall between ULA’s current Atlas V and Delta IV boosters. ULA expects that “bare bones” Vulcan launch services will sell for half the price of an Atlas V, which is less costly to fly than the Delta IV. The Vulcan first stage is not designed to be recovered as a unit and reused like the SpaceX Falcon. Instead, ULA is planning a future version that will be partially reusable. In this version, the engines will be designed to detach from the booster after engine cutoff, descend through the atmosphere inside a heat shield, and deploy a parachute for final descent and recovery. ESA’s current Ariane 5 medium- to heavy-lift booster has a two-stage, liquid-fueled core rocket flanked by two large solid rocket boosters. 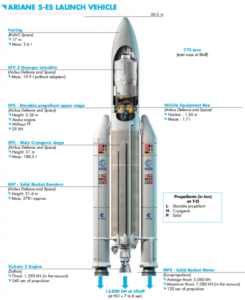 The basic configuration of Ariane 5 is shown in the following diagram. Ariane V is an expendable booster, not designed for reuse. Ariane 5 first flew in June 1996 and has been employed on a wide variety of Earth orbital and interplanetary missions. Versions of Ariane 5 can deliver a payload of more than 44,000 pounds (20,000 kg) to LEO or 23,100 pounds (10,735 kg) to GTO. 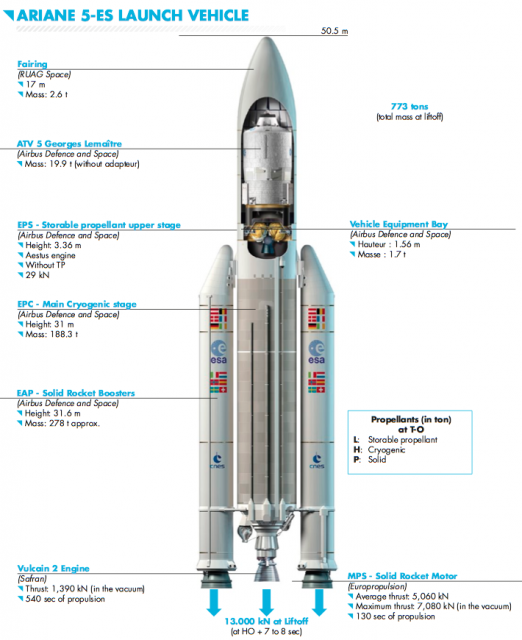 In 2014, ESA announced the basic configuration of the Ariane 6 launch vehicle. 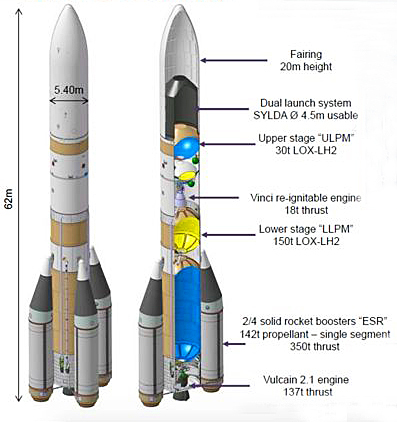 Like Ariane 5, Arian 6 will have a two-stage, liquid-fueled core rocket flanked by solid rocket boosters. Ariane 62 and 64 are expendable boosters, not designed for reuse. In 2015, Airbus Defense and Space announced plans to develop a partially reusable first stage named Adeline that could enter service on a future version of Ariane 6 in the 2025 – 2030 time frame. Like ULA’s plans for Vulcan, only the Ariane 6 first stage high-value parts (i.e., the engine) would be recovered for reuse. 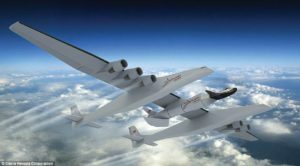 Paul Allen’s firm Stratolaunch Systems is building what will become the world’s largest aircraft, for use as an airborne launch platform for a variety of booster rockets that will take small-to-medium payloads into Earth orbit. The Stratolaunch Carrier will have two fuselages, six jet engines, a length of 238 feet (72 m), and a wingspan of 385 feet (117 m). The giant plane is designed to carry a rocket and payload with a combined weight of up to 550,000 pounds (250,000 kg) to a launch altitude of about 30,000 ft (9,144 m). Payloads up to 13,500 pounds (6,136 kg) can be delivered to LEO. The Stratolaunch Carrier can fly more than 1,000 miles to reach the launch point, giving it unprecedented operational flexibility for delivering payloads to orbit. An example mission profile is shown in the following figure. In 2014, a planned partnership between Stratolaunch Systems and SpaceX for an air-dropped version of the Falcon booster failed to materialize. In October 2016, Stratolaunch announced a partnership with Orbital ATK, which will provide Pegasus XL expendable boosters for use in launching small satellites into Earth orbit from the Stratolaunch aircraft. 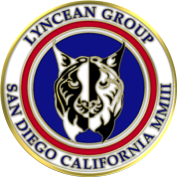 You’ll find a list of worldwide orbital launch systems at the following link. Most of these are expendable launch systems. In the highly competitive launch vehicle market, booster reusability should yield a significant economic advantage. In the long run, demonstrating better launch service economies will determine the success or failure of reusable launch vehicles. While SpaceX and Blue Origin have demonstrated the technical ability to recover and reuse the first stage of a launch vehicle, they have not yet demonstrated the long-term economic value of that capability. In 2017, SpaceX plans to re-fly about six Falcon 9 v1.2 boosters, with even more recycled boosters to be launched in 2018. Blue Origin will likely start New Shepard passenger flights in 2018. I’m betting that SpaceX and Blue Origin will be successful and reusable boosters will find a permanent role in reducing the price for delivering cargo and people into space. There are two U.S. firms that have succeeded in launching and recovering a booster rocket that was designed to be reusable. These firms are Jeff Bezos’ Blue Origin and Elon Musk’s SpaceX. Their booster rockets are designed for very different missions. Blue Origin’s New Shepard booster and capsule are intended for brief, suborbital flights for space tourism and scientific research. The booster and capsule will be “man-rated” for passenger-carrying suborbital missions. In contrast, SpaceX’s Falcon 9 booster rocket is designed to deliver a variety of payloads to Earth orbit. The payload may be the SpaceX Dragon capsule or a different civilian or military spacecraft. Currently, the Falcon 9 booster and Dragon capsule are not “man-rated” for orbital missions. SpaceX is developing a crewed version of the Dragon capsule that, in the future, will be used to deliver and return crewmembers for the International Space Station (ISS). Both firms cite a cost advantage of recovering and reusing an expensive booster rocket and space capsule. Let’s see how they’re doing. The basic flight profiles of a single-stage, single engine New Shepard booster and capsule are shown in the following diagram. The primary goals of each flight are to boost the capsule and passengers above 62.1 miles (100 km), safely recover the capsule and passengers, and safely recover the booster rocket. You can see in the diagram that the booster rocket and the capsule separate after the booster’s rocket engine is shutdown and they are recovered separately. At separation, the booster and capsule are traveling at about Mach 3 (about 1,980 mph, 3,186 kph). The orientation of the booster rocket is controlled during descent and the rocket engine is restarted once at low altitude to bring the booster to a soft, vertical landing. Both the booster rocket and the capsule are designed for reuse. This same New Shepard booster was launched again on 22 January 2016, completed the planned suborbital flight, and again made an autonomous safe landing. This flight marked the first reuse of a booster rocket. 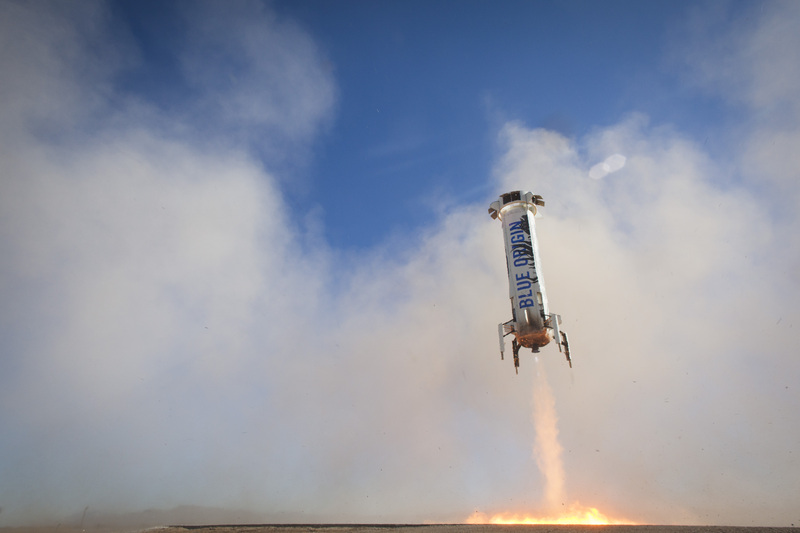 Again using the same hardware, New Shepard was launched on its third flight and safely recovered on 2 April 2016. On this flight, the rocket engine was re-started at a lower altitude (3,635 feet, 1,107 m) than on the previous flights to demonstrate the fast startup of the engine. The booster rocket made an on-target landing, touching down at a velocity of 4.8 mph (7.7 kph). In this video, the view from the capsule at 64.6 miles (104 km) above the Earth is stunning. As the landing of the booster rocket approaches, it is dropping like a stone until the rocket engine powers up, quickly stops the descent, and brings the booster rocket in for an accurate, soft, vertical landing. So, the current score for Blue Origin is 3 attempts and 3 successful soft, vertical landings in less than 5 months. The same New Shepard booster was used all three times (i.e., it has been reused twice). Refer to the Blue Origin website at the following link for more information. 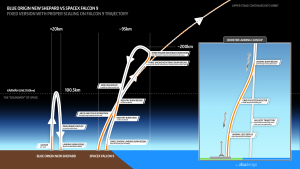 The basic flight profile for a two-stage Falcon 9 recoverable booster on an orbital mission is shown in the following diagram. For ISS re-supply missions, the target for the Dragon capsule is in a near-circular orbit at an altitude of about 250 miles (403 km) and an orbital velocity of about 17,136 mph (27,578 kph). The first stage shuts down and separates from the second stage at an altitude of about 62.1 miles (100 km) and a speed of about 4,600 mph (7,400 kph, Mach 7). 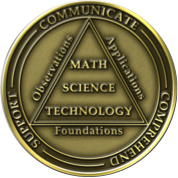 These parameters are for illustrative purposes only and will vary as needed to meet the particular mission requirements. 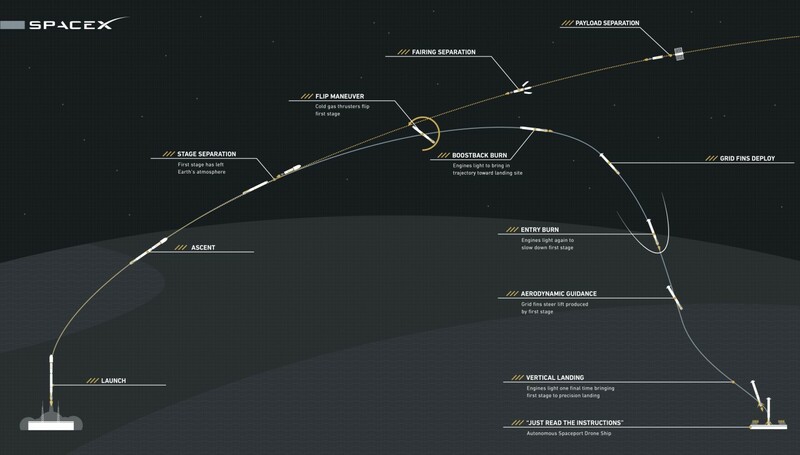 The second stage continues into orbit with a Dragon capsule or other payload. 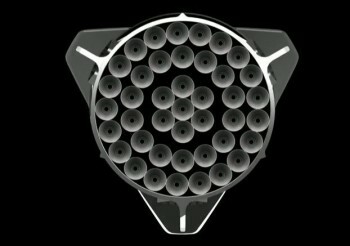 The nine-engine first stage carries extra fuel to enable some of the booster rockets to re-start three times after stage separation to adjust trajectory, decelerate, and make a soft vertical landing on an autonomous recovery barge floating in the ocean 200 miles (320 km) or more downrange from the launch site. The empty weight of the recoverable version of the Falcon 9 first stage (the F9R) is 56,438 pounds (25,600 kg,), which is about 5,511 pounds (2,500 kg) more than the basic, non-recoverable version (V1.1). The added fuel and structural weight to enable recovery of the first stage reduces the payload mass that can be delivered to orbit. The autonomous “drone” barge is a very small target measuring about 170 ft. × 300 ft. (52 m × 91 m). It is equipped with azimuthal thrusters that provide precise positioning using GPS position data. The Falcon 9 booster knows where the drone barge should be. 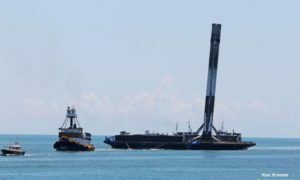 The Falcon 9’s four landing legs span 60 ft. (18 m), and all must land on the barge. 10 January 2015: First attempt; hard landing; booster destroyed. 11 February 2015: High seas prevented use of the barge. 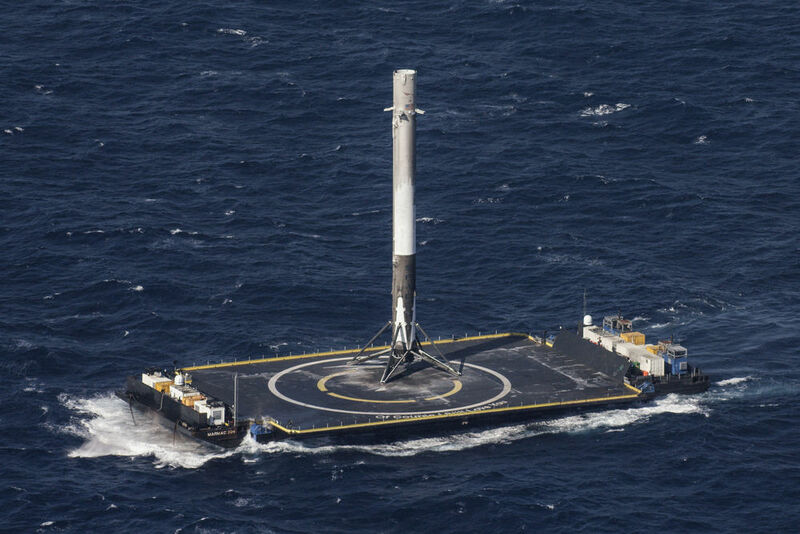 Instead, the Falcon 9 first stage was flown to a soft, vertical landing in the ocean, simulating a barge landing. 14 April 2015: Second attempt; successful vertical landing but the booster toppled, likely due to remaining lateral momentum. 7 January 2016: Third attempt; successful vertical landing but the booster toppled, likely due to a mechanical failure in one landing leg. 4 March 2016: Fourth attempt, with low fuel reserve and using only three engines; hard landing; booster destroyed. On 8 April 2016, a Falcon 9 booster was launched from Cape Canaveral on an ISS re-supply mission. The first stage of this booster rocket became the first to make a successful landing on the drone barge downrange in the Atlantic. In the video, you will note the barge heaving in the moderate seas. 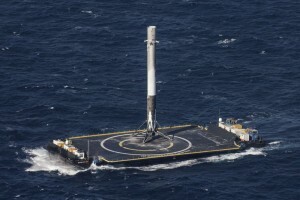 After landing, the 156 foot (47.5 m) tall booster rocket is just balanced on its landing legs. Before the barge can be towed back to port, crew must board the barge and secure the booster. This is done by placing “shoes” over the landing feet and welding the shoes to the deck of the barge. Once back at Cape Canaveral, the booster will be examined and the rocket engine will be test fired to determine if the first stage can be reused. Previously, on 21 December 2015, SpaceX successfully launched its Falcon 9 booster on an orbital mission and then landed the first stage back on the ground at Cape Canaveral. As shown in the diagram below, this involved a very different flight profile than for a Falcon 9 flight with a landing on the downrange drone barge. For the December 2015 flight, the Falcon 9 first stage had to reverse direction to fly back to Cape Canaveral from about 59 miles (95 km) downrange and then decelerate and maneuver for a soft, vertical landing about 10 minutes after launch. After recovering the booster, the Falcon 9 was inspected and the engines were successfully re-tested on 15 January 2016, on a launch pad at Cape Canaveral. I could not determine if this Falcon 9 first stage has been reused. 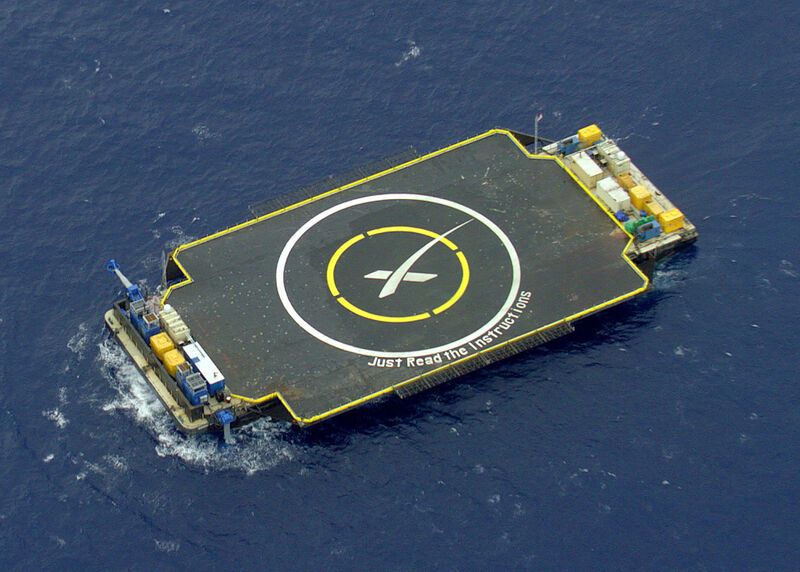 So, the current score for SpaceX is 6 attempts (not counting the February 2015 soft landing in the ocean) and 2 successes (one on land and one on the drone barge) in 15 months. Refer to the SpaceX website at the following link for more information. 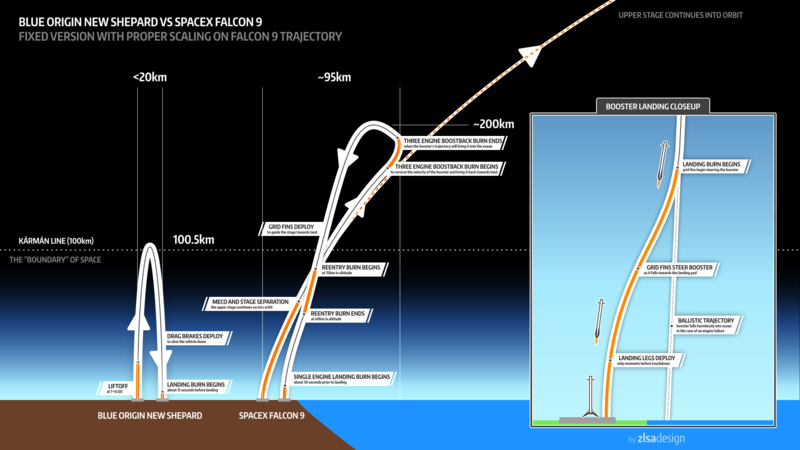 In the above diagram for the December 2015 Falcon 9 flight, the relative complexity of a typical New Shepard flight profile and the Falcon 9 flight profile with return to Cape Canaveral is clear. The Falcon 9 flight profile for a landing on the small, moving, down-range drone barge is even more complex. The New Shepard sub-orbital mission is much less challenging than any Falcon 9 orbital mission. Nonetheless, both booster rockets face very similar challenges as they approach the landing site to execute an autonomous, soft, vertical landing. Both Blue Origin and SpaceX have made tremendous technological leaps in demonstrating that a booster rocket can make an autonomous, soft, vertical landing and remain in a condition that allows its reuse in a subsequent mission. Blue Origin actually has reused their booster rocket and capsule twice, further demonstrating the maturity of reusable rocket technology. It remains to be seen if this technology actually delivers the operating cost savings anticipated by Blue Origin and SpaceX. I hope it does. When space tourism becomes a reality, the hoped-for cost benefits of reusable booster rockets and spacecraft could affect my ticket price.